A horrendously bad campaign for Dundee United continued last night after a team that plays in the division below overtook them in terms of victories against top flight sides. 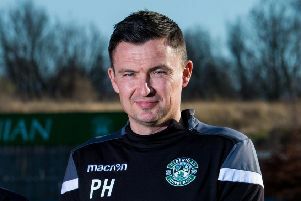 While United’s chances of making a Ross County-style great escape from relegation were going up in smoke with a 3-0 home defeat against nearest challengers Motherwell, Hibs were busy beating the Ladbrokes Premiership’s third best side, local rivals Hearts. It’s the fifth time this campaign that Alan Stubbs’ men have squared off against top flight opponents this season and they’ve yet to lose a single game, winning four and drawing one. Meanwhile, United have only won three league games, drawing five and sitting 13 points adrift at the bottom of the table. This impressive Hibs run includes a 3-0 victory over United in the League Cup, where the strolled to victory. Their march to the final of the competition also saw them dispose of Aberdeen and St Johnstone in the semi-final. Fortunately for Hibs, rather than meeting Rangers, a Championship side they’ve lost to three times, they’ll be facing Ross County in a Hampden showdown on March 13. The Highlanders currently sit joint-fourth in the top tier, and were recently beaten 3-0 at home by Hearts, a team Hibs made to look very ordinary last night. So, using playground logic, Hibs should be certain favourites to lift the League Cup.